Synopsis: This paper will reiterate an important principle in continual improvement, that knowing what your customers want should go hand in hand with a sound understanding of your organisation's work processes. The voice of the customer and the voice of the process are complementary realities. To be successful, management must take both of them into account. In the previous two papers, we have outlined a method for understanding and improving work processes based on knowledge of variation and process behaviour charts. You might be wondering at this point: Where do specifications and standards come in? Surely we must pay attention to the dividing line between what is acceptable and what is not acceptable to our customers? Indeed we must. It is vitally important that we deliver to performance standards demanded by customers, else we don’t have a business. It is only from a place of thorough understanding of work processes that management will be able satisfy customer demand. Imposing standards without understanding the underlying processes simply does not work. Not only that, but it results in man-made chaos, worsening performance, demotivating staff and unhappy customers. We see it all too often in our public services: targets for the NHS that force hospital managers to focus on the numbers they report instead of directing all efforts to improving patient care; local authorities that slash services instead of making improvements in work processes. “Finding efficiencies” often means cuts. The only way to find genuine efficiencies is by understanding work processes. When managers do understand variation and take appropriate action, the ’magic’ of continual improvement happens: customer satisfaction goes up even as costs go down. How do knowledge of the customer and knowledge of the process combine and complement each other? Process behaviour charts, combined with an understanding of routine and exceptional variation, elicit the necessary information about the inner working of processes. We use process behaviour charts, first of all, to check whether a process is predictable. If a process displays exceptional variation, we must take steps to remove the causes of it. Once the process has become predictable, we will be in a position to assess what it is capable of achieving. It is of course possible for a process to be predictable and unsatisfactory. One example is long waiting lists in the NHS. A reliable prediction can be made that patients will have to wait a certain number of weeks or months to get an operation, but that length of time may be unacceptable. In cases like these, a process redesign is called for, in order to eliminate rework, waste, delays and bottlenecks from the workflow. By comparing the voice of the customer (i.e. specifications) with the voice of the process (i.e. process behaviour charts), we find out to what extent the process is capable of satisfying the customer. The process represented in Figure 1 is clearly not capable of reliably satisfying customer demand. 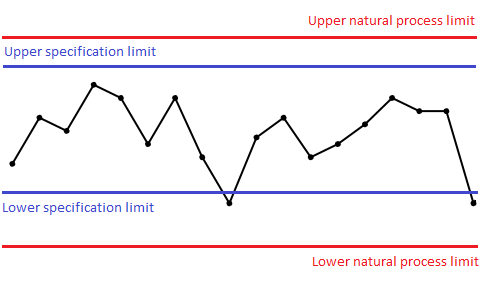 The natural process limits are wider than the specification limits, so any number of points can fall outside specification. Processes that are predictably unsatisfactory need to be redesigned in order to reduce their routine variation. 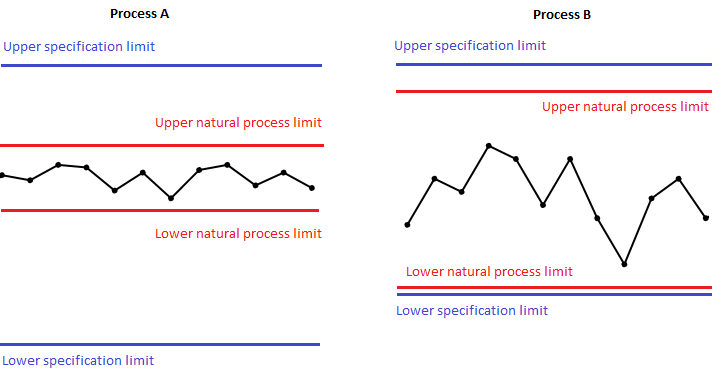 And there is more to it than just bringing the natural process limits within the specification limits. Let’s compare Process A and Process B in Figure 2. If Process B happens to wander a little (let’s say a special cause of variation suddenly occurs), it can soon produce outcomes outside the specification. Process A on the other hand, has a lot more room to wander before it produces any outcomes outside the specifications. Therefore Process A is a lot more capable than Process B. It is management's job to shape up and improve work processes so that they reliably deliver what the customer wants. In Peter Scholte’s words, “we must create systems that routinely allow excellent work to result from the ordinary efforts of ordinary people”. Process improvement work happens in cycles, each new cycle building on the previous one - a continual improvement endeavour that brings rewards in the shape of increased efficiency and productivity, lower costs and better customer satisfaction. It’s a win-win formula, proven to work.